Why do we feel a tingle when we lick a 9V battery? If you're familiar with Ohm's Law, you know that voltage is a function of current and resistance (namely, V = IR). The important thing to remember is that everything is a conductor and can be modeled as a resistor. Things like wire and metal are obvious conductors and have a low resistance. Your body is also a conductor - just a poor one. That's about 1.3mA of current flowing between the battery's terminals, which is a good deal more than the current flowing during the dry skin test (0.09mA). As it turns out, your body has a pretty strong reaction to electric current. Even tiny amounts of current can be felt and be potentially dangerous. Anything less than about 1mA is imperceptible. When we held the 9V to our tongue, about 1-2mA was flowing between the terminals. Because the tongue consists of a thin membrane with nerve endings near the surface, we could readily feel the current as it excited the nerves. Anything higher than 9V could be potentially dangerous to our poor tongue. While it might be safe to handle 9V batteries with our bare hands (that 100kΩ offers a good deal of protection from that small voltage), ~1mA directly through the heart is enough to cause ventricular fibrillation (the heart stops beating in a coordinated manner and cannot pump blood to the rest of the body). This requires electrodes being punctured into the body near the heart. In this case, even something like 9V can be lethal (remember: your internals have a LOT less resistance than your skin, some estimations as low as 300 Ω). Above about 10mA, you lose control of your muscles, which means that you will likely be unable to let go of the thing that's shocking you. Work with at least one other person present and use rubber-coated equipment. More safety guidelines can be found here. AC and DC have slightly different effects on the body, but both can be equally dangerous. To determine which is more painful, check out this video. Back when I was in university (electrical engineering), I took an electrical machinery course. Working with power transformers and big induction motors can be dangerous, so we got a few pointers from electricians. 1) When you're working with high power gear, turn it off and lock the switch. 2) If you can't make Rule #1 happen, put one hand in your pocket. Seriously. That way, if you do bridge a pair of high voltage contacts, the current is through one hand. It might destroy your hand, but you'll be alive --- probably. 3) If you can't make Rule #1 happen, assume all lines are live. If you need to touch a line that could be live (i.e. any of 'em), tap it with the back of your hand. That way, if it's live, the spasm will pull your hand away instead of locking it to the live line. And then there's my own addendum: The question isn't: "Am I being paranoid?" The question is: "Am I being paranoid enough?" Of course, this doesn't cover it. Not by a long shot. But there is an underlying theme: be very, very careful, and learn everything you can. If you get a chance to learn from tradespeople who work with wiring and live circuits for a living, do it. If you do the one hand trick, the one that goes in your pocket is your LEFT hand. The reason is that the path to ground from your right hand is down the right side of your body and through your feet. In other words, your heart is not in the path to ground. I don't know if that would make a difference, but it's what I was taught. I learnt the back of your hand trick in relation to watching something about how to escape from a building in a fire or other emergency, and is a useful one to pass on. If you're, say, using your hand to find your way against a wall in a dark and smoke filled build, use the back of your hand so as not to accidentally grab onto any exposed wiring. It is very dangerous to touch any high-voltage wire. Never use the back, or front, of your hand to test for a live wire. Instead of your body, use a multimeter (and make sure it's rated for the type of voltages you're working with). Rules (1), (2), and (3) are really good though. Additional rule: Remind yourself of all of the above often. My father (an electrician) used to drill these into me as a kid, and got forgetful one day...now he has two fake teeth from knocking out the originals when he accidentally hit a live wire. Tesla's rules! Words to live by (and die by ignoring). Though I'm having trouble finding any citation of them as Tesla's. Well said, and good advice! The real fun starts above 100mA, where the danger of arrhythmia and nerve damage abate and you're simply cooking the tissue in situ. Engineers plump when you cook 'em! I saw stars...and colors...and I bit my tongue...and I had a burn on the side of my nose for several days. ...and I went out and bought some decent wire strippers. The story about licking 9v batteries reminds of a Jr. High School science fair many years ago. Someone brought in a home made one tube radio (IIRC it used a 1U4 tube). He had problems getting it to work. The radio was powered by a #6 drycell for the filament, and a small "B" battery of 45 or 67.5 volts that looked like an over grown 9v battery (just a bit thicker and somewhat longer with similar terminals.). Anyway nobody had a volt meter so the guy first tested the #6 dry cell with his tongue (barely gave him a sour taste, but we figured at 1.5 volts that was about right. You've probably guessed what happened next. Needless to say that B battery wasn't completly dead. The galvanic reaction caused a muscle spasm that ended up with the battery being pitched out the window! Poor idiot had a splitting headache all afternoon! (He was fine the next day BTW). I am surprised it only take 20mA. Seems low to me, I thought it was more like an Amp. When I as younger I used to work at a Vacuum shop doing repairs. One evening I grabbed two test leads at the same time while they were powered. (The other guy didn't like the rubber boots). I ended up in the hospital. But no damage. It sure felt like a lot more than 20mA. It was 110V from one hand to the other. I couldn't let go till I was unpluged. I felt really good after until I almost passed out. The paramedic said she was surprised I didn't have burns and that the grease on my hands helped. I tell you hearing the sirens coming for you really makes you think. Be careful with power! When you touch your main AC socket, you'll get in Europe around 230V @50Hz. That would be using this calculation 220V/100kOhm = 2,2 mA. Which would only cause a "Tingling sensation", which simple isn't true for AC sockets. I know the table and calculations are only for DC circuits, but how do you calculate this for AC? "Offhand it would seem that a shock of 10,000 volts would be more deadly than 100 volts. But this is not so! 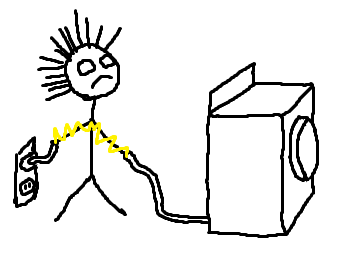 Individuals have been electrocuted by appliances using ordinary house currents of 110 volts and by electrical apparatus in industry using as little as 42 volts direct current. The real measure of shock's intensity lies in the amount of current (amperes) forced though the body, and not the voltage. " But by using the I = U/R calculations and using this table here, 10kV would always be way more dangerous than 42V. How does that work? What you have got to remeber for AC circuits is that this calculated current is an RMS, which means Root Mean Square, value. So 220V/100kOhhm would be 2.2 mA like you calculated above but that is the average RMS current that will pass through your body. To get the real, known as the peak-to-peak, current that will pass through your body you must take this value and multiply by 2sqrt(2). Doing this will give you roughly 6.3mA which is in the pain region mentioned above. This is the peak maximum current that will pass through your body during every period or cycle. Your second question of why low voltages can be dangerous too is because the resistance of your skin can be lower one day than it is another (based on how dry/wet it is). The amount of current your body will draw will be larger if the resistance of your skin is lower. Ahh, tongue - the poor man's multimeter! It came in handy when I had to figure out the layout of unmarked cables running through the office. ... glad I lived to tell that tale. Nice article, thanks! Agree with TimCole, #1 is to turn off power (preferably at the source) and lock out the switch. If you can't make #1 happen, find someone else to continue to job. The article has also inspired me to integrate the receptors in my tongue into my Google glasses, thus eliminating the need to carry around that pesky multimeter.